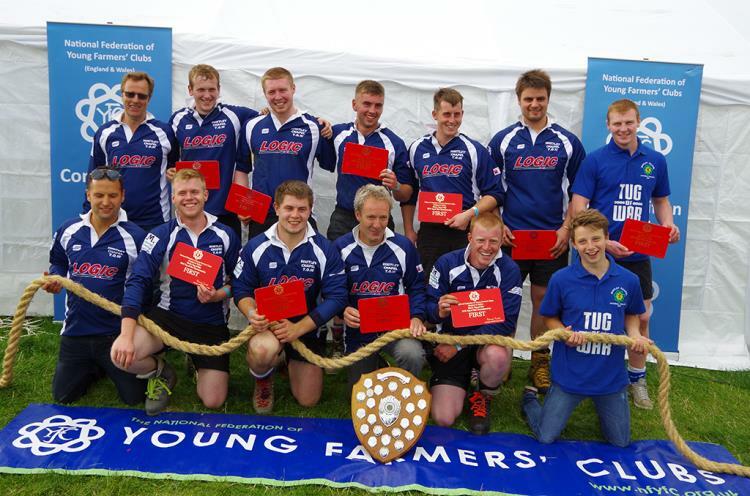 Whitley Chapel YFC continued its success in national competitions with victory in the men's tug of war finals at the Tenbury Show in Worcestershire. Having won this year's pantomime competition at April's Annual Convention, the Northumberland side (pictured right) pulled out all of the stops to claim victory, owing its success to fellow county member Stu Ridley. Stu, who was the subject of the 'Stay Strong Stu' campaign, died of an inoperable brain tumour last month at the age of 25. Many of the Whitley Chapel team went to school with Stu. Matthew Hope, from the Whitley Chapel team, said: "The team was really strengthened at the beginning of the year. We begun this year's training in February around the same time Stu was diagnosed with an inoperable brain tumour. The team got together, doing the Wot-Not run, (a hand powered rail rail cart) from the Scottish border to the Northumberland County show, raising over two thousand pounds for the 'Stay Strong Stu' campaign. The team really feels that Stu really helped to inspire us throughout the year. "The team could not be more shocked about the win to be perfectly honest. The victory really means a huge amount to the team. We are all good mates who just live a stones throw from each other and all help each other out when ever needs be, so for us all to have accomplished this together is an unbelievable feeling." Whitley Chapel beat Bilsborrow YFC of Lancashire in the final to claim victory, with Bridgwater YFC of Somerset coming third and Waterhouses YFC of Staffordshire finishing fourth. Meanwhile, Tenbury YFC ladies team came out on top in their home event, beating Penistone YFC of Yorkshire in the final. Haldon Group YFC of Devon came third with Hermon YFC, Pembrokeshire finishing fourth. Trecastle YFC of Brecknock came first in the junior tournament having beaten Grayrigg YFC of Cumbria in the final. But there was good news for the Cumbria side, after they were chose to represent England in the GENSB International Tug-of-War tournament in Holland at the end of August. In the third-placed match. 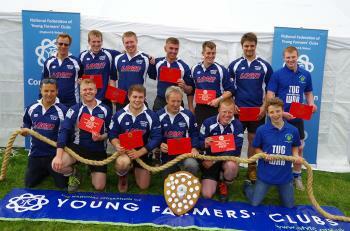 Worcestershire's Upton-upon-Severn YFC beat Hope Valley YFC of Derbyshire. A full list of Results is available on the NFYFC website. You can see all of the best photos from the competition on the NFYFC Facebook page. British Food Fortnight is back and will be taking place from 19th September - 4th October and the organisers are keen for YFC members to get involved and champion British produce. Click here for more information about British Food Fortnight and how your club can get involved. The National Federation of Young Farmers’ Clubs (NFYFC) acknowledges the extremely difficult circumstances that dairy farmers currently find themselves in. With the current global supply of milk substantially outweighing the demand, supermarkets are able to sell milk at lower prices, which currently has a knock-on effect to the supplier. This situation means that dairy farmers are finding it increasingly difficult to recover their production costs. It is clear that this situation needs remedying and the NFYFC is fully dedicated in its support to the dairy industry. Many young people are passionate about this topic and individuals are taking it upon themselves to participate in protests across the UK. We support their right to do so, as long as the protests are peaceful, law-abiding and do not tarnish the reputation of the farming industry. But from speaking to our members, we also believe that we must work together to help resolve the situation. A petition has recently been launched calling on the government to introduce minimum prices that suppliers receive for their milk. 10,000 signatures will lead to the government responding to the petition and 100,000 signatures will trigger a debate in Parliament. The NFYFC believes that this is a proactive and unified way of calling for change and, as such, the Federation will be actively encouraging all of its members to sign this petition and inspire their friends and family to do the same.